Wood is a natural material which, in spite of the passage of time, always remains a living organism, which is strongly influenced by various physical factors, such as, e.g. temperature, atmospheric pressure, humidity of the air, or sunlight. That is why even an instrument made in the best possible way needs to be cared for by the owner. Attention and care for an oboe in the form of careful wiping it after playing, or protecting it against sudden changes of temperature, is always essential in order that the instrument should give the user full satisfaction for many years. I always request oboists to care for their instruments. For many reasons. Also, because the trees which are cut down in order to make oboes often grow very slowly and I believe that it is barbarity to let an instrument get destroyed by nothing but laziness of their owners. What is it to devote even as little as a few minutes to wiping the instrument compared with the several dozen of years, or – as in the case, for instance, of European boxwood – 100 and more years which are needed for the tree to grow? So, care of an oboe has also an environmental dimension. – as a case use the one attached by me or use other materials, but always natural ones, e.g. wool, cotton. 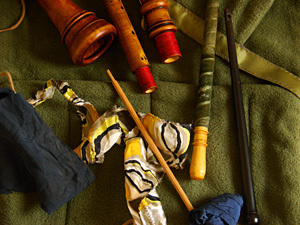 Never put the oboe into synthetic materials which are impermeable to air, i.e. various kinds of foil, or plastic wraps. Every new instrument should be given a very slow gradual break-in period. A new oboe, in order to gain the plenitude of the possibilities of its tone must, so to say, ‘learn’ the sounds. Such an oboe does not know yet why it was created… it must find it out. That sounds poetical, but it is a fact that an oboe which is slowly, gradually and properly broken in will have a better tone and established character of the sound. The fact that an oboe has to ‘learn’ the sounds is as familiar to the oboists from their own experience as the fact that for some time oboes ‘remember’ the tone and character of the sound of the oboists who play on them. It may happen that after lending your instrument to another oboist you take it back after some time, but with a little bit different tone. Fortunately, it is a reversible process. It is enough to play the oboe regularly. – play for about 1 hour a day until the sixth month. Only after half a year do I recommend the intensive playing on a new oboe. When breaking it in, it is important to get the whole scale of sounds out of the instrument, to play legato, staccato, and, of course, to play long sounds. I know that very few oboists are capable of refraining from intensive playing on a new instrument, so I will add that if you play intensively at the beginning of breaking in a new oboe it is worth wiping the bore from time to time.